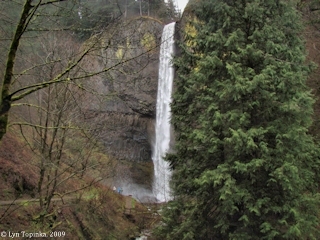 Click image to enlarge Latourell Falls, Oregon. Image taken March 22, 2009. Two roadhouses existed along the Historic Columbia River Highway at Latourell Falls. 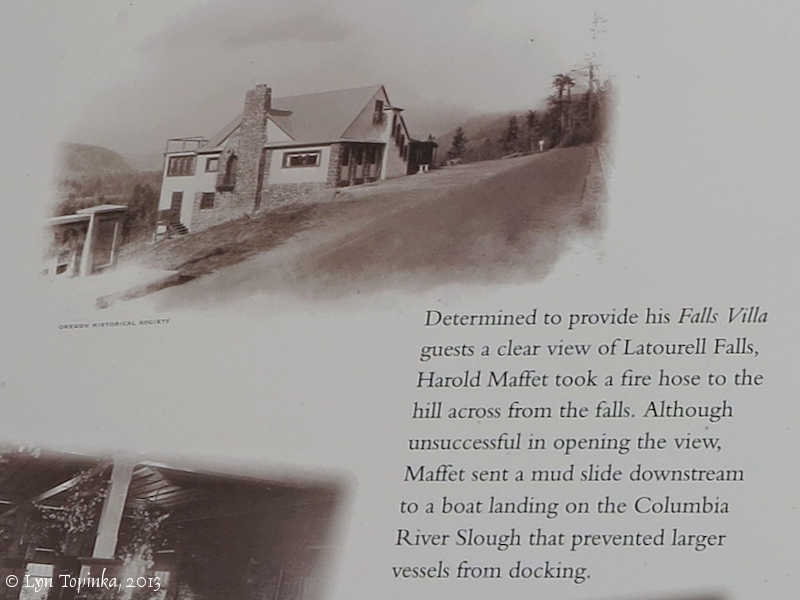 Latourell Falls Chalet was built on the south side of the Columbia River Highway, and, after it burned, Maffett's Villa was built on the north side of the Highway. Today this area is part of the Guy W. Talbot State Park. "... Upon completion of the highway, commercial development started immdiately. The Maffet family owned the land along Falls Creek below the falls, where the new highway bridge spanned the creek. In 1914, Margaret Henderson, who had earlier hosted at the Chanticleer Inn, built, in association with Harold Maffet, the Falls Chalet on the hillside above the highway bridge. In January, 1915, after operating only six months, the Falls Chalet burned, a temporary set back for Henderson. However, the loss did not dash her entrepeneurial spirit as she quickly found another location above Crown Point to start anew. After the fire, her "silent" parner, Harold Maffet, built his Falls Villa on the north side of the highway at the east end of the bridge. Maffet's Falls Villa opened in June, 1915, only five months after fire destroyed the Chalet. Maffet remodeled and made extensive additions to the Villa in 1923. In the late '20s, Harold Maffet and George Joseph took a "giant," a gravity-fed water cannon, to blast away the hillside across the highway to give Villa patrons a better view of Latourell Falls. A subsequent owner added a gift shop on the south side of the highway. Another commercial development included a garage and service station built near the west entry to the town of Latourell. The new highway provided Latourell residents with a route to reach other communities more easily. Consequently, when Henry Shoults' grocery store in Latourell burned in November, 1916, he did not rebuild. ..."
Source: Clarence E. Mershon, 2006, "The Columbia River Highway, From the Sea to the Wheat Fields of Eastern Oregon, 1913-1928", Guardian Peaks Enterprises, p.113-115. 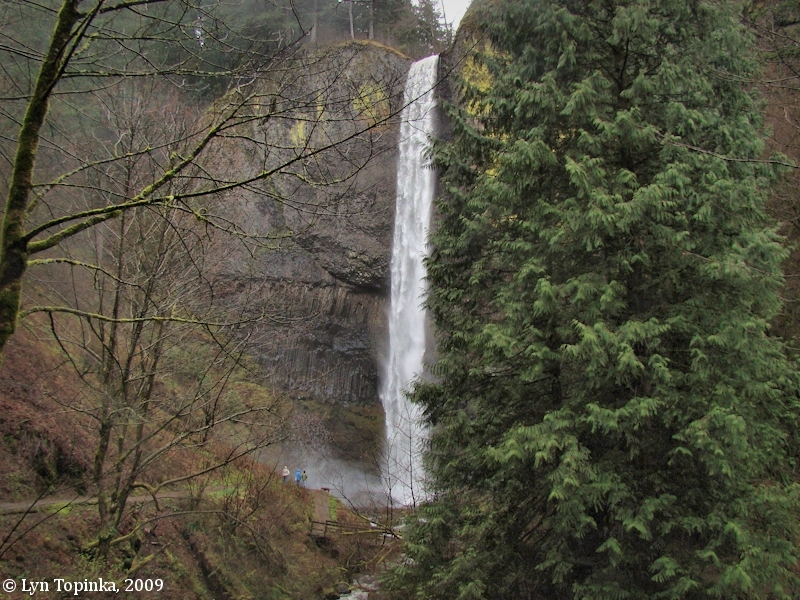 Click image to enlarge Guy W. Talbot State Park at Latourell Falls, Oregon, looking east. Image taken March 3, 2013. Maffett's Villa was located on the left in this image and the Falls Chalet was located on the hill on the right in this image. Today this area is part of the Guy W. Talbot State Park. Click image to enlarge Roadhouse information sign, Latourell Falls, Oregon. Image taken March 3, 2013. 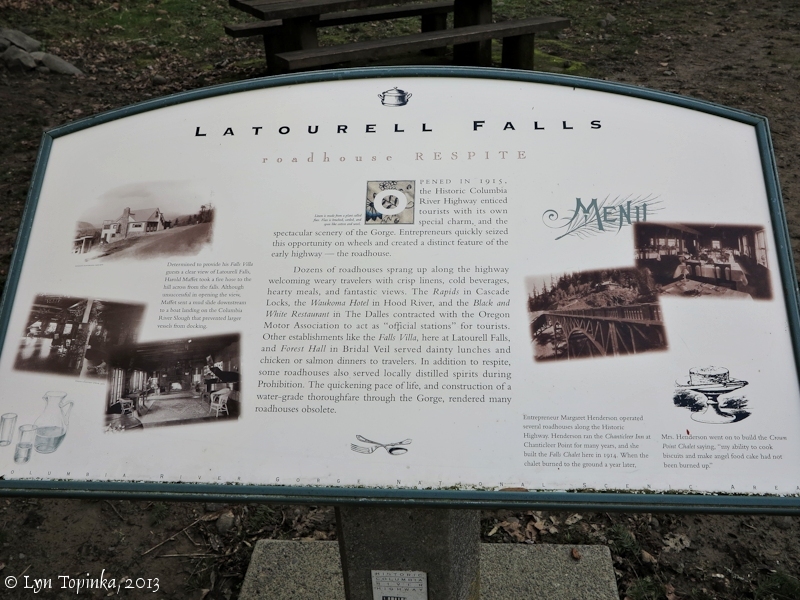 In 1914 the Latourell Falls Chalet opened at Latourell Falls, along the Columbia River Highway. 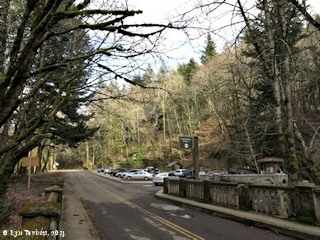 The establishment was located on the south side of the highway, just east of Latourell Falls. The owner of the establishment, Mrs. Henderson, had been part owner in the Chanticleer Inn, located downstream, and had left to establish her own eatery. After being open only six months the Latourell Falls Chalet burned, leaving nothing behind. Mrs. Henderson regrouped and started a new eatery downstream, near Crown Point. "... At Latourelle a concrete bridge across the gorge of Latourelle Creek brings the traveler to Falls chalet, a unique hostelry set on the edge of the all but perpendicular bank and but a few rods from the wierdly beautiful Falls of Latourelle Creek, that here drop a hundred feet or more in one sheer leap, dashing in spray on the rocks at the bottom. Here one may find such food and shelter as he perhaps has dreamed of but has seldom experienced. 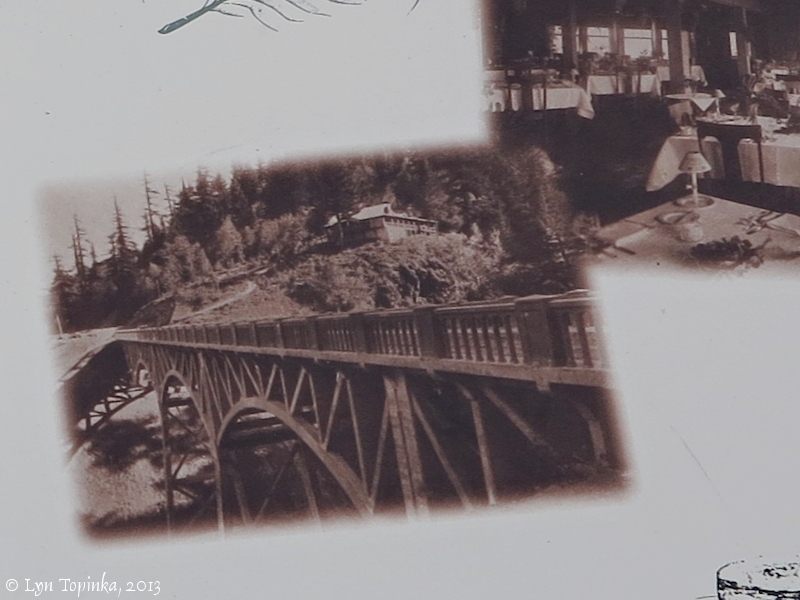 ..."
Click image to enlarge Latourell Falls Chalet on information sign, Latourell Falls, Oregon. Image taken March 3, 2013. In 1915, five months after a fire destroyed the Falls Chalet, another roadhouse, "Maffett's Villa" (also known as "Latourell Villa" or "Falls Villa"), opened on the north side of the Columbia River Highway, east of the Latourell Bridge. 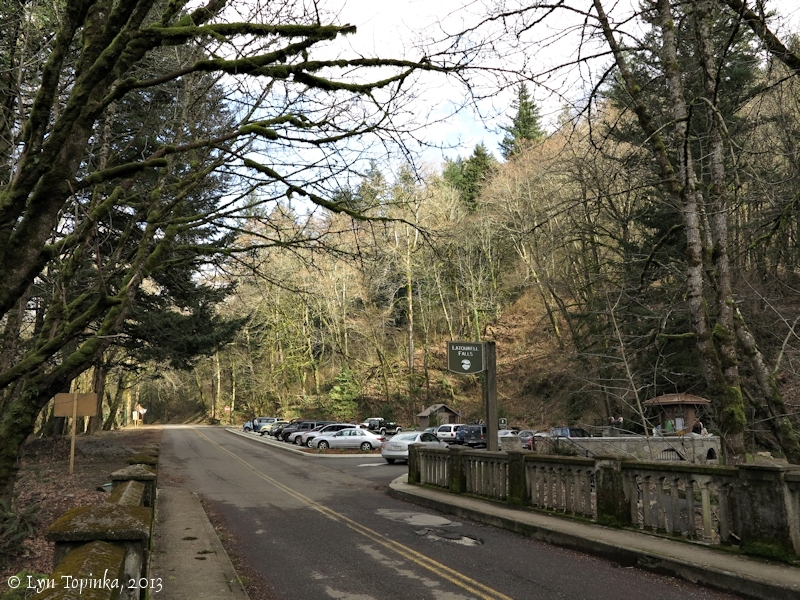 In 1959 the State of Oregon purchased the "Villa" and subsequently tore it down and added the land to the Guy W. Talbot State Park. Source: Add appearing in "Official Columbia Highway Tour", 1916, Published by The Scenic Tours Company, Portland, Oregon. Click image to enlarge Maffett's Villa ("Falls Villa") on information sign, Latourell Falls, Oregon. Image taken March 3, 2013.